The term “Equity-Mindedness” refers to the perspective or mode of thinking exhibited by practitioners who call attention to patterns of inequity in student outcomes. These practitioners are willing to take personal and institutional responsibility for the success of their students, and critically reassess their own practices. It also requires that practitioners are race-conscious and aware of the social and historical context of exclusionary practices in American Higher Education. 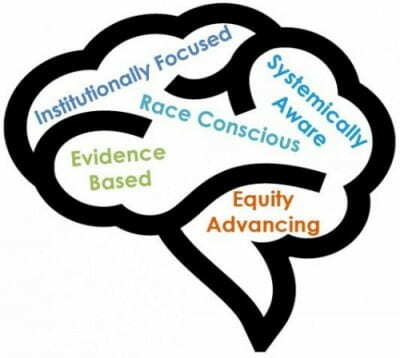 In order to understand and become “Equity-Minded”, it warrants that various practitioners (faculty, administration, staff, etc.) assess and acknowledge that their practices may not be working. It takes understanding inequities as a dysfunction of the various structures, policies, and practices that they can control. “Equity-Minded” practitioners question their own assumptions, recognize stereotypes that harm student success, and continually reassess their practices to create change. Part of taking on this framework is that institutions and practitioners become accountable for the success of their students and see racial gaps as their personal and institutional responsibility. CUE Director Estela Mara Bensimon developed twelve indicators to help institutions develop a practice of Equity-Mindedness. 2) Do you have a set of racial equity indicators that you monitor annually? 3) Does your campus have goals that are explicitly stated by race and ethnicity to improve retention, graduation, STEM participation, etc. ? Does your campus recruit community college transfer students and report on transfer access by race and ethnicity? 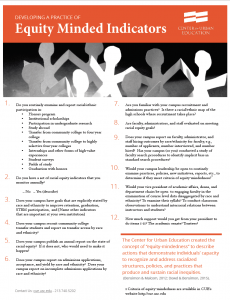 4) Does your campus recruit community college transfer students and report on transfer access by race and ethnicity? 5) Does your campus publish an annual report on the state of racial equity? If it does not, who would need to make it happen? 6) Does your campus report on admissions applications, acceptance, and yield by race and ethnicity? Does your campus report on incomplete admissions applications by race and ethnicity? 7) Are you familiar with your campus recruitment and admissions practices? Is there a racial/ethnic map of the high schools where recruitment takes place? 8) Are faculty, administrators, and staff evaluated on meeting racial equity goals? 9) Does your campus report on faculty, administrator, and staff hiring outcomes by race/ethnicity for faculty, e.g., number of applicants, number interviewed, and number hired? Has your campus (or you) conducted a study of faculty search procedures to identify implicit bias in standard search procedures? 10) Would your campus leadership be open to routinely examine practices, policies, new initiatives, reports, etc., to determine if they meet criteria of equity-mindedness? 11) Would your vice president of academic affairs, deans, and department chairs be open to engaging faculty in the examination of course level data dis-aggregated by race and ethnicity? To examine their syllabi? To conduct classroom observations to understand interracial relations between instructors and students? 12) How much support would you get from your president to do items 1-11? The academic senate? Trustees?